While Venice sorts out how to stay afloat, especially given the latest record aqua alta, the mayor is working at making it a more decorous place. There’s certainly a lot that can be done around St. Mark’s Square - Piazza San Marco in Italian - to make it more welcoming for tourists and residents alike. As Reuter’s has reported, Venice tourists are encouraged to keep themselves decorous while visiting the (still) floating city. To help, Venice will deploy stewards in Saint Mark’s square to prevent tourists from stripping off their T-shirts, taking a nap or dropping fast-food wrappers in the Piazza. 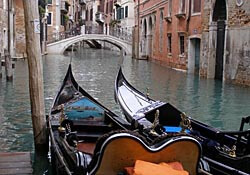 The Venice mayor wishes to keep the square clean, to better show off what has long been one of the world’s biggest tourist attractions, bordered by St Mark’s Basilica and Clocktower, the Doge’s Palace, and the Grand Canal. “Six stewards, men and women, will explain to tourists that it is not a good idea to eat, camp out, lay down or walk around the city bare-chested,” said the deputy mayor, Michele Vianello, adding that the stewards would not be handing out fines. Now the canal city is also working on laws to stop the sale of fast food in the square “to try to limit the amount or rubbish which is difficult for us to clean up”, Vianello said. The souvenir stalls lining many of the canals and streets near the Piazza San Marco are also on the mayor’s hit list. These sellers of cheap Chinese plastic gondolas and ’funny’ t-shirts may go the way of the pigeons of Venice, should things go to plan. However, we’re left to wonder about what is going to happen to the intrusive, and very ugly, advertising hoardings now hanging from some of the very same tourist attractions around Piazza San Marco that the mayor wishes to keep presentable. Arts officials in Venice have resorted to taking the advertising lucre to bolster their empty pocketbooks and keep their institutions running. It’s however upset many who love Venice and who, I believe, rightfully say the advertising leaves an ugly impression on the city’s visitors. Now, if the mayor could rid Venice of over-the-top advertising as well, the job would be a good one.